Mercury in retrograde, full moon, racing from one thing to the next…does it ever end? Today I woke up a little later than usual and of course this put me behind the eight ball-so to speak- throughout the day. I felt like I was running from one thing to the next and as if life was a blur. Of course anything that could go wrong, went wrong, because isn’t that just how it goes? I went into my classroom and tried to get ready for my 1st graders to come through the doors. I always like to make sure that when they walk through the door, they see a smile and not a rushing, crazy idiot! Today, that was a challenge though. I tried to print morning work and there was an issue with the printer. Next I tried to get online for a backup plan, but that didn’t work either. I rushed to find a solution and came up with something just in time, but the day was already spinning out of control. After the kids came in and started on morning work I remembered that I had to do lovely progress monitoring. I pulled the iPod out of my drawer and had technical difficulties with that too. After wasting at least 30 minutes trying to get technology to work with me so that I could get the ‘data’ teachers are expected to report, I finally got things rolling, but it was clear that my energy needed a shift. I progress monitored 6 students (tested them…oh I LOVE those tests) and then we were off to lunch. I was definitely on edge with the kids and that’s so NOT fair to them! Some days we lay our yoga mats on the ground and go to our ‘Happy Place,’ other days we do power yoga or color mandalas. I usually take this 10-15 minutes to breathe and release some tension or get ready for the next hour with the kids (ironically, I am not always mindful during mindful time). But today- TODAY was a day when Mindful Time really made the difference for me. The kids came into the classroom and parked themselves on the community rug for instructions. I instructed them to use mandala’s to quiet their minds and then walked to my desk to ‘catch up’. Fortunately, I caught myself and decided that I too needed to practice mindfulness. 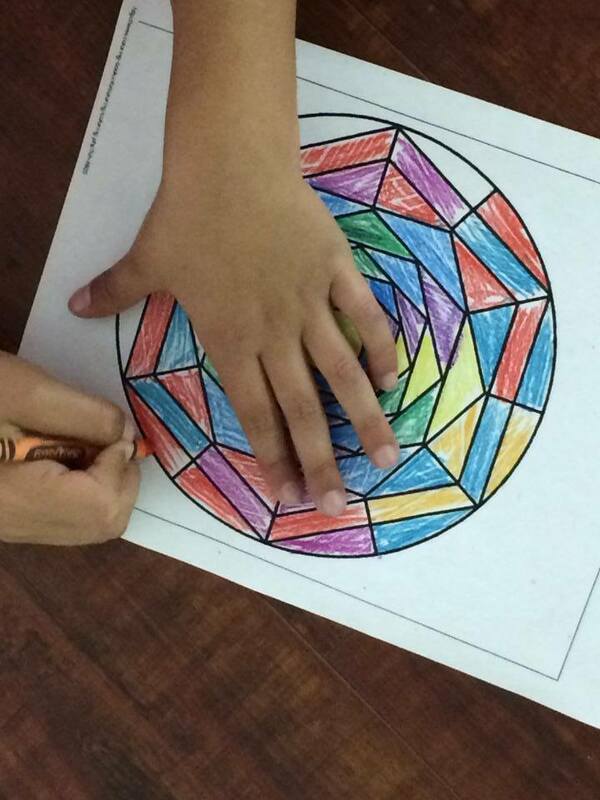 I announced to the kids that I was going to color a mandala today as well. I chose one, pulled out my crayons (that was really awesome-I love the smell of crayons) and began to color my mandala from the inside out. As I colored I shared some thoughts with the kids. They were so happy to have me join in as well and so intrigued by my coloring and choice of colors. I smiled to myself because of their excitement. Time was up. I began to pack my crayons away and began counting down for the kids to do the same. When the kids came to the rug again for instructions something was different…I was different. My energy was now re-balanced and even though things were still ‘ticking’ me off throughout the afternoon with technology and testing, the edge was now gone! This made me realize that we all need to push that pause button throughout the day. I literally sat and colored (yes, I colored with crayons) for about 10 minutes and suddenly life didn’t seem so tough after all. Mindfulness doesn’t have to happen at the same time every day and it doesn’t have to happen in a certain way. Mindfulness just needs to happen. And the only way for us to be mindful is to sometimes hit the PAUSE button. Try it. 10-15 minutes (even 5 minutes) in the middle of your stressful day can totally make all the difference in the world. Go ahead, pull out a box of crayons-I dare you!